In the photo is Israel, a 17-year-old resident of Maison de Lumiere orphanage. Just a month before this photo was taken, Israel had lost his business partner and all their equipment. Their business had been solidifying, and we could see Israel carving out an economically successful future for himself. 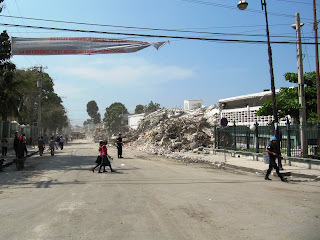 However, on January 12 when the quake hit, the office building where they worked collapsed, demolishing their equipment and killing Israel's partner. In 45 seconds, Israel's future seemed to have disappeared in a cloud of concrete dust. Now Israel's grief over losing his business partner is intertwined with distressing questions about his future and the future of his "brothers" at Maison de Lumiere. It is out of that place of heavy suffering that he worships. This photo was taken on February 12, one month after the quake, while we were engaged in Haiti's weekend of national fasting and praying. Haiti is no joke. A situation can turn from innocuous to dangerous in a matter of seconds. I have seen this happen a couple of times, and it was underlined again on this last trip. No doubt I will receive a tutorial on what I did wrong that day, but here is the story. We were running a medical clinic at a small slum a few blocks away from the guest house. About a dozen of us had walked from MDL to this further "ravine" community. The medical clinic was functioning smoothly, and four of us were heading back to the guest house – Chris Cannon, Ashley Hapak, Joy Bohlinger, and I. As we were leaving, I wanted to get a closer look at the little row of shacks beside this small community to see what kind of condition they were in following the earthquake. This involved walking a few steps down the road. Make no mistake about it – Jesus loved kids. 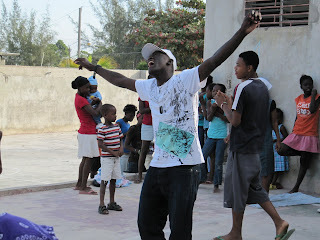 And part of being the incarnational presence of Christ in our neighborhood in Haiti is loving kids. I preached a short message on Mark 10:13-16 at the final feeding program I attended. I asked the children, “Do you think Jesus ever got angry?” Many answered, “No.” I then read the passage from Mark and told them about how one of the few things that made Jesus angry was when his friends tried to keep children from coming to him. 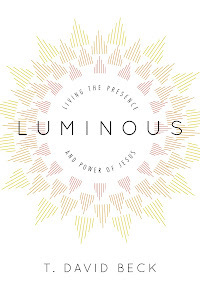 Jesus did not have an “adults-only ministry,” as much as that might have seemed appropriate to his followers. They believed him to be a leader who would soon marshal an army and change the world. But Jesus’ ministry was not one of military conquest. He was more concerned with demonstrating the love of God through truth-telling, healing, exorcism, and compassion. He cared for people of all ages, and he seems to have especially enjoyed the company of children and outcasts. 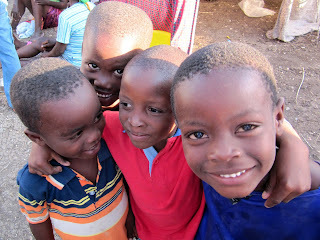 A dear friend told me last night that she noticed that my blog posts seemed to change as I spent time in Haiti. At first I wasn't sure why that would be, but then I recalled a fundamental shift that took place in my experience there. It was what I think of as the shift from spectacle to people. I made this shift in a smaller way the first trip I took there, and it was replayed in a much deeper way on this last trip. A reporter asked me last night where God was in Haiti. I responded that he is in the compassion and love shown by people, one to another. I talked about ministering to the Haitians, and about receiving ministry from the Haitians. In particular, I described what I think of as Roseline’s Tarp Party. 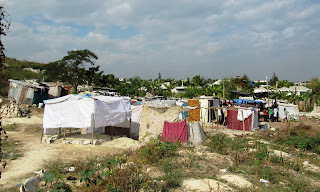 Today we are leaving Haiti. I wish I had an extra day just to blog more stories. I will try to do that over the next couple of days. I am not even sure how to describe this trip. Everything around here was still pretty raw when I got here. Life was just starting to return to some semblance of normalcy when Tom, Nancy, Rod, and I arrived. 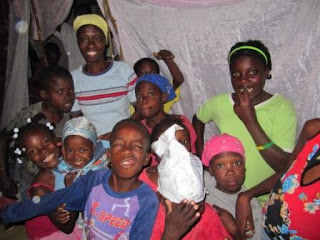 I came with a duffle full of MREs and emergency water bags, not knowing whether there would be food at the orphanage. The grocery store opened the day before we arrived. It was an amazing thing to have free access to food.